So often I get emails asking recommendations for a complete curricula that is in Spanish/Bilingual/literature heavy/STEM focused/or something else. Too often what we are looking for is not available, so it is up to us as homeschool parents to create our own curriculum to meet the needs of our children and family. I've been piecing together our curriculum for a while now, and felt it was a good time to share how I do it and give you some tips for putting together your own. After that first year, I was ready to branch out on my own and pull together a curriculum for my daughter. Although we loved the curriculum, I quickly discovered that she was at vastly different levels in each subject and the math just wasn't a good fit for her learning style. For instance, she was a fantastic reader and her literacy skills were equal to a much higher grade while in math (her least favorite subject) she was at or below grade average. For my own sanity (and hers), I decided to piece together our curriculum for the next year pulling from different sources for each subject so that we were at the right level for each one to challenge her without frustrating her. Okay, so now that I've said all that, let's get to it. What is my child's learning style? What do I want from a curriculum? Each year when I begin putting together our curriculum, I start off writing a list of all the subjects I want my kids to study over the school year. If you're unclear which ones to include, I high recommend picking up a copy of the Core Knowledge series (aff link) for the grade your child will be starting. So for example, this year I have a fourth and a sixth grader. I'll pick up a copy of "What Your Fourth Grader Needs to Know" and "What Your Sixth Grader Needs to Know." Okay, so now you have your list of subjects. Next to each one, write down how your child learns that subject best. For example, my daughter is a very hands-on learner in science, but in math, she is very visual and even prefers real life problems. Boring texts for history are definitely out; she prefers project-based learning. Now I set my budget. Typically, I limit myself to around $300 each year, but that varies. I've spent way more and way less. And keep in mind two things: Think about what you'd spend if your kids were going to a traditional school (public or private), and if your budget is small to non-existent, you can use the resources available to you (your library, the internet) to find free materials. Once you've done that, it is time to look at the curricula available keeping in mind what it is you want out of each one and your budget. REMEMBER: If you choose to buy a used curriculum, there may be writing in the student pages. If you don't care, go for it. But I personally prefer a curriculum that has clean pages so my kids can write directly in them. TIP: If you are careful, you can sell the materials when you are finished with them and put that money toward the next year's curriculum. You can do this by photocopying pages (pretty expensive) or by using transparencies to cover the pages and let your kids use dry-erase markers to fill in the work. You just check the work, then erase it and use the transparency over and over again. Before buying ALWAYS go to the company's website and download a sample of their materials to see if it is a good fit for your child. Don't forget that apps and online game sites, such as those by PBS KIDS, are another fun way to teach important concepts in almost any subject! ONE LAST TIP! 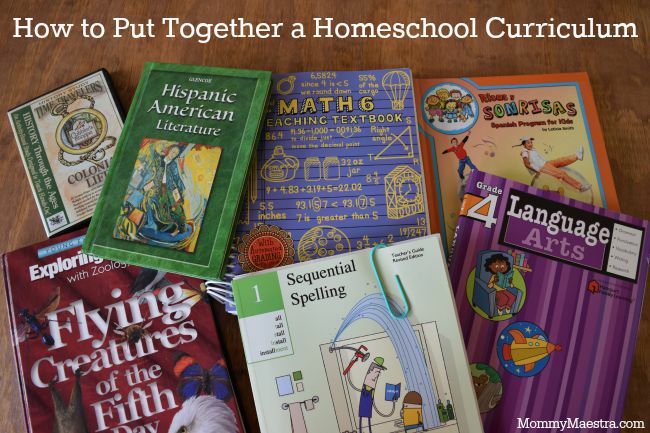 Many homeschool curriculum companies have sales toward the end of the summer because by then, most people have already purchased their curriculum. If you are not picky about when you start, you can get some amazing deals at the end of July and beginning of August! Question for you. Did you ever use curriculum for various subjects *in Spanish*? I've started w/ dd for preschool & we're considering continuing. But one of our reasons for considering homeschool is language. It's not the only one, but if we do homeschool we'd really like to do so, at least in the beginning couple of years, primarily in Spanish. Thus far I've been able to piece together our curriculum. (Plus it's a bit simpler at this age.) We'll start the PK4 work from Handwriting w/o tears using their book in Spanish. We have a pre-math and pre-reading book that we bought while in Puerto Rico (husband's place of origin). I also scored Kumon's Numeros 0-30 at our local Target. And I picked up an in Spanish pre-k workbook at Costco as well. Those two I bought intending to use, but also partially just to let the seller know that I'm in the market for this type of thing! I know that bilingual homeschoolers are the minority of the minority, but we do exist, lol! Anyway, I'm just curious what you've found and also if you're taking the approach of teaching the various subjects in English and then Spanish as a separate class. Hey, Joanna. I've done both, but what works for us is my teaching Spanish as a separate subject since I didn't start off speaking to them only in Spanish. But I have many readers who divide up their subjects teaching some in English and the others in Spanish. This is a great question, I have found that for us teaching is Spanish is better since my in laws are from Puerto Rico too they don't speak well the English. But I truly find it very difficult to buy books just in Spanish for classes like history, geography, and more. I have try big companies but they are not willing to sell books to a single person they have contract with big schools. If i could find a books store that have a lot of materials in Spanish and are willing to sell books to homeschooler that would be great. you have any suggestions will be great.